As one of many Tropical North Queensland businesses which promotes tourism within the Daintree Rainforest, we rely heavily on the continued protection of this, the world's oldest rainforest. We feel it is the obligation - and the privilege - of every business which benefits from the Daintree to do their part to protect this globally unique resource, not just for next season's tourists, but for future generations. Cairns Unlimited is proud to be part of Rainforest Rescue's exciting 'DAINTREE BUYBACK AND PROTECT FOREVER PROJECT'. OVER THE YEARS, CAIRNS UNLIMITED HAS HELPED 'RAINFOREST RESCUE' BUY BACK THOUSANDS OF SQUARE METRES OF DAINTREE RAINFOREST FOR PERPETUAL PROTECTION. TO HELP, CLICK ON THE LINK TO SAVE THE DAINTREE RAINFOREST. 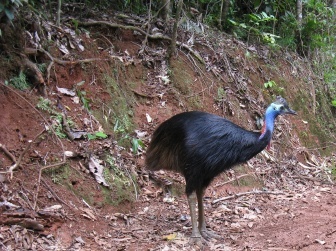 On a recent trip to Cape Tribulation, the Cairns Unlimited team were delighted to see a Cassowary in the wild. This was the first time we had seen one of these endangered birds outside of wildlife parks, and that day we saw not just one but three Cassowaries while winding our way from the Daintree River to Cape Tribulation. One of them even emerged cautiously from the rainforest to venture towards us where we had parked, which was remarkable as they are extremely shy by nature. This close encounter reminded us of the fragility of the Cassowary's habitat, and in fact its very existence. It also reminded us that part of our mission statement when we launched Cairns Unlimited was to ensure that we play our part in protecting this wonderful region that we live in. 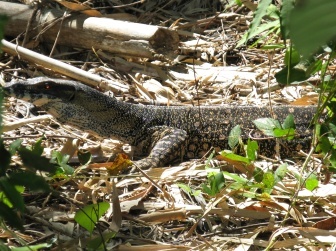 Since the road to Cape Tribulation was sealed some years ago, the settlement of the privately owned allotments within the Daintree has resulted in a continuing loss of habitat for the Cassowary, the primitive Musky Rat-kangaroo, the rare Bennett's Tree Kangaroo, endangered Spotted-tailed Quoll, and a myriad of smaller creatures little known to science. Yes, there is still a massive amount of rainforest that is protected. One might think there's nothing to worry about. But the key term here is 'connectivity'. If the Daintree Rainforest is allowed to be 'compartmentalized' or cut off from the adjoining upland rainforests, the long term effects could be disastrous for this globally unique ecosystem. At the time of writing, Rainforest Rescue's "Daintree Buy Back and Protect Forever Project" has contributed to the purchase and protection of nine properties so far. The properties are being managed for their conservation values, which will be protected forever. The properties saved so far form a vital corridor between different ares of Cow Bay, Forest Creek and Cape Tribulation. JUST $32 BUYS BACK 25 SQUARE METRES OF PRICELESS DAINTREE RAINFOREST! You may also be interested to know that Conveyancing services are provide by a project supporter at no cost. The only expense is State Government Stamp Duty, which is reimbursed once the properties are declared as a Nature Refuge. The Douglas Shire Council has exempted the properties from local government rates. WORLD FAMOUS JOURNALIST AND BIOLOGIST, DR. DAVID SUZUKI, URGED ALL AUSTRALIANS TO GET BEHIND RAINFOREST RESCUE'S "DAINTREE BUY BACK AND PROTECT FOREVER PROJECT".